However, with funding for VR having reached around $3-3.5 billion in 2014, interest in Virtual Reality is now gaining momentum. Innovative companies incorporate it into their processes; from the world’s first operation streamed globally through VR at Royal London Hospital, to airlines offering VR entertainment packages aboard long-haul flights, the NBA planning to use it during live games and estate agents are allowing house buyers to view properties via the new technology. However, enhancing customer experience and performance through VR is just the beginning. In every profession or trade, knowledge retention is a key issue in education and training. People retain 10% of the information they read, 20% of what that they hear but 90% when they physically interact with the subject matter. VR could be the solution to this. What you read or hear in a classroom could then immediately be put it into practice with VR, speeding up the pace of learning. This is already being put into practice by some companies. NASA is using VR to train its engineers how to launch satellites, while soldiers are ‘experiencing’ combat before they go into action, and TfL is combining VR with immersive cab simulators to train their drivers. A whole range of further possibilities will open up once VR is combined with the IoT and sensor technology. The data gathered will be able to be ‘seen’ and acted on immediately, leading to the rise of entirely new businesses and jobs. In fact, our recent study [PDF] showed that big data and analytics skills will be those most in demand in three years’ time. For example, a telecoms company can use IoT to monitor set top boxes which allows for predictive maintenance and completely changes the business process. The telecoms provider does not have to wait for a phone call when a customer has a problem, instead it calls its customer to say the box is about to fail and asks when they want to schedule maintenance. This can be taken to another level when VR is added to the process – imagine if engineers could fix the box remotely using the technology. So how will this work? More and more of our everyday objects such as our homes and cars, are connected to the internet, with sensors collecting data continuously. Once this sensor data is combined with VR technology it is possible to create a fully immersive, shared and real-time experience whereby the ‘screen’ represents our reality. While the Royal London Hospital may have been broadcasting the operation, we should think ahead to the time when surgeons can actually practise and complete their training using their ‘connected’ instruments on VR patients rather than cadavers or test subjects. We could also see surgeons being able to operate on patients remotely by using VR to operate robotic arms; something which could help provide the poorest areas of the world with highly-skilled doctors. Many companies are already sourcing the budget for the technology and are looking to launch pilot projects as soon as possible. However, just because the technology exists does not mean that it should be adopted immediately. 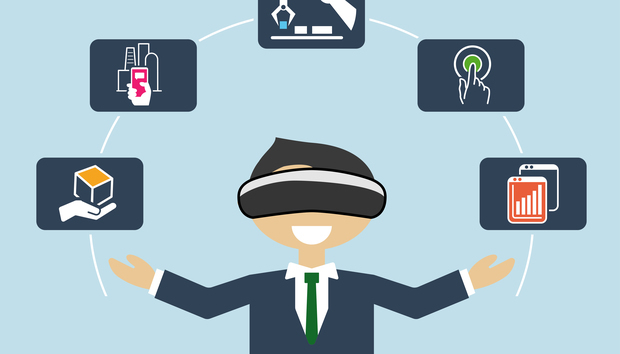 For most traditional industries, it is not yet time to make bet-your-brand investments in Virtual Reality. Instead, organisations need to immerse themselves in VR techniques, platforms and devices to find how the technology fits into, and benefits, their enterprise strategy. And VR is not the only platform they should be looking at. In addition, organisations also need to explore the impact of augmented reality (AR) and 360-degree video. AR technology allows users to ‘be’ in the real world but with a digital layer added to it to provide some further context. Google Glass, HoloLens and Magic Leap are some examples of devices adding the AR layer. 360-degree video uses some of the same technology and similar devices but it does not allow users to interact with their surroundings. Through Virtual Reality, for example, users can animate and create a Virtual Reality scuba experience where they decide which direction they go into and which fish they would like to look at. Or, organisations could attach a 360-degree camera to a real scuba diver to capture what they are doing and then deliver that experience via a VR headset. The aim is to make the experience more engaging, whether this is for a customer looking to purchase a diving course, or an employee initially learning to dive. Although still in their infancy, businesses must turn their attention to these technologies now or risk losing out on a key learning period in an increasingly digital, diverse and competitive world. To do this, they should work with experts to find ways to merge strategy, design and technology seamlessly, either incorporating them into existing business strategies or creating news ones. Savvy leaders would do well to begin piloting and exploring now as to whether AR, VR or 360-degree video could have a major impact on their business and increase its competitiveness. Leaders in today’s world need figure out how to work better and run differently – it is about starting small, failing fast and scaling quickly. Without a doubt, their competitors will be scrambling to do the same. « What's important for the digital CIO?